Looking towards Birmingham along the down side of Saltley station's island platform with Saltley viaduct seen in the distance 25th October 1964. Access to the station was via steps from Saltley viaduct which carried Saltley Road across the former Midland Railway's Derby to Birmingham line. Saltley Junction was immediately the other side of the viaduct whilst a little further on, and to the left, was Landor Street Junction. As can be seen, the station is in a poor state of repair and was not often used and certainly not by many enginemen as Vauxhall and Duddeston on the former Grand Junction route Birmingham to Bescot was only five minutes from Saltley shed compared to ten minutes from Saltley station. 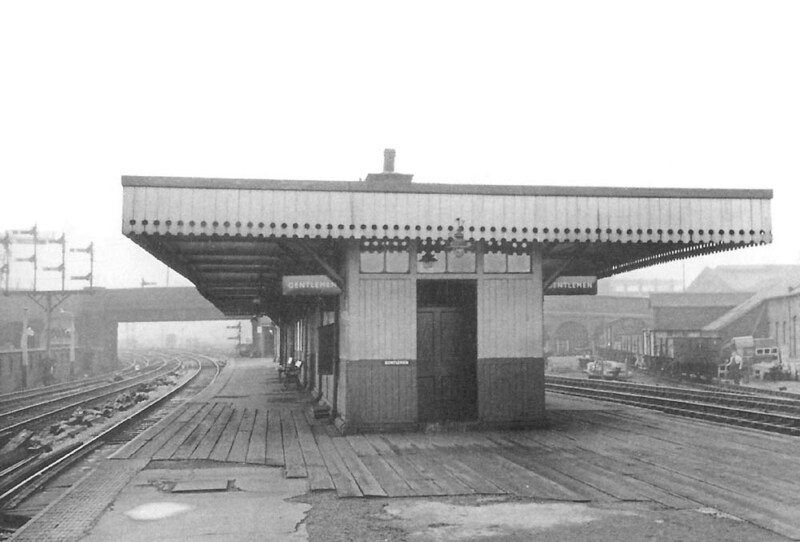 The patching of the platform with timbers is indicative of the 'mend and make do' philosophy adopted by British Railways for its final years until closure in 1968, four years after this photograph was taken. One of Birmingham's many canals passed under the station at this point and to the left inside the four foot - the distance between the rails of each set of track - the steel girders of the bridge carrying the track over the canal can be seen. In all probability the timber planking on the platform surface was being used to repair the platform.